Yes, I had a title, but then I forgot it. Then again, I suppose the question should be raised, why am I typing a blog at this hour? No idea. Today's random rambling: the movie HUGO. I was actually surprised at how this movie did tie into the real life George Melies, who did exist and did make hundreds of films. Even more surprising was that the lady he was living with towards the end of his life, was, at one point, his Mistress. That was a shocker. Is quite young, and there isn't really anything wrong with that. 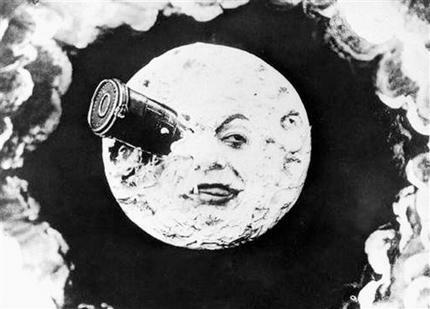 The image above is from 1902 silent film “Le Voyage Dans La Lune”, and features in HUGO, as part of the plot. The movie itself is fairly good, and I was actually aghast at how I thought it would be rather terrible. Shows how little I know, right? All in all, check it out.